Caught with drugs or paraphernalia in school? Tips from a lawyer. Using of vape pens and bringing edibles to school is gaining in popularity among students. Schools have responded with a zero tolerance policy if a student is caught with possession of a drug, drug paraphernalia, or if they distribute of drugs. Even pretending that a something is a drug can be cause for suspension or expulsion. Each school district has their own rules for what is banned from a school campus. Most common drugs like marijuana, ecstasy, and cocaine are banned. Prescription drugs like Adderall, Xanax, and Ativan can also be banned if the student who has them is not the prescribed person. What about having a vaping device, rolling paper, pipe, or other paraphernalia on school grounds? If a school finds a student with drug paraphernalia like a pipe, vaporizer, or Juul they will submit it for residue testing. A pipe or other device with tobacco residue is usually treated less severe than if it was used with marijuana. Even if the student did not have possession of the drug on school, whatever residue was found will be considered. I was pretending that an edible had drugs in it, but it didn’t. Even joking around that an edible has drugs in it can be cause for suspension or expulsion from school. Can you help me fight a suspension or expulsion from school? Yes. I defend students throughout Florida in student disciplinary hearings. Using my nearly twenty years of legal experience combined with specialized knowledge of the student disciplinary process, I give students the best chance at a successful outcome. 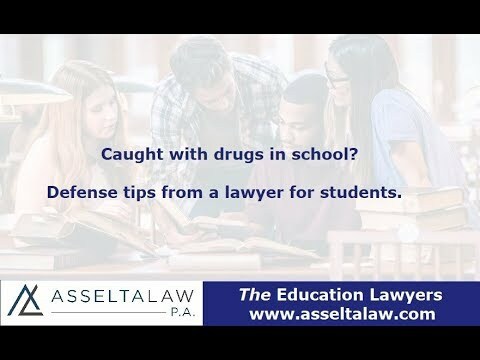 Richard Asselta is an award-winning lawyer for students who assists students facing suspension or expulsion from school. Call today and start building your defense.